While falling sales drive Navistar's claims rate upwards, Paccar finds ways to cut warranty costs. And both GM and Ford continue to report some of the lowest warranty cost per vehicle metrics in the world, while Tesla gets its warranty costs under control. With this installment of our weekly newsletter, we finish up a worldwide tour of the warranty expense rates reported by American, Asian, and European manufacturers in the heavy equipment, passenger car, light truck, and on-highway truck industries. Let's divide the coverage below into three sections: first, a quick look at four of the top U.S.-based truck manufacturers, followed by a snapshot of the top four U.S.-based passenger car and light truck manufacturers, and finally a summary of the warranty cost per vehicle for all 13 of the worldwide automotive OEMs that we've reported on in the past few newsletters. In Figure 1 below, we're plotting the warranty expense rates of three top U.S.-based truck manufacturers, and one diesel engine manufacturer. Paccar Inc. is the parent company of Kenworth Truck Company, Peterbilt Motors, and DAF Trucks, which manufacture and/or export heavy trucks all over the world. Navistar International Corp. manufactures trucks and buses under brand names such as IC Bus and International Truck. Cummins Inc. is a top manufacturer of diesel engines for heavy trucks. And Oshkosh Corp. manufactures a variety of vocational and specialty trucks such as fire engines, tow trucks, concrete mixers, cherry pickers, and military vehicles. Volvo would be in very good company in this chart, with its most recent claims rate of 2.3% coming in just below Cummins' 2.4% and just below the 2.5% that Paccar reported for most of last year. Paccar has since seen its claims rate dive to 1.3%-1.5% -- almost as low as Oshkosh. Notice that Navistar, which had been making a steady effort to reduce its warranty expense rates to normal levels ever since they spiked out of control in 2013 and 2014, suffered a bit of a setback in the first quarter of 2016. That's because Navistar's sales dropped but its claims didn't. And since the claims rate is calculated by dividing sales into claims, Navistar's claims rate jumped back up to the uncomfortable level of 5.9%. Assuming sales get back to normal soon, we would expect the claims rate to do likewise. The other surprise is that Oshkosh consistently reports such a low rate of warranty expenses. It almost seems like it belongs with the construction equipment OEMs profiled in last week's newsletter. And its presence in the construction industry through brand names such as JLG Industries and McNeilus certainly merit its inclusion in the company of manufacturers such as Caterpillar, Deere, Terex, and Manitowoc. But we suspect one of the big reasons for the company's relatively low expense rates is its thriving presence in the military vehicle business. Product warranties are funded differently and claims are settled differently under military supply contracts as opposed to commercial sales. Another big reason -- and this may apply equally to other construction equipment and vocational vehicle manufacturers as well -- is that commercial customers in the construction industry tend to rely upon extended warranty contracts for continuing coverage of their assets, and the manufacturers may be inclined to assign more of the cost of warranty work to that category of coverage as a result. In other words, we see the lower expense rate in product warranty, but we can't see the correspondingly higher expense rate in the extended warranty account. So we shouldn't assume that construction equipment has a naturally lower rate of warranty expense than on-highway trucks, because we're not seeing the complete expense picture. Much the same pattern can be seen in the accrual rates of the truck manufacturers, as seen in Figure 2. Once again, Volvo would be in good company with Navistar, Cummins, and Paccar. And once again, Oshkosh distinguishes itself with expense rates consistently below the baselines of its peers. The big difference here is how radically some of the truck manufacturers have cut their accrual rates. And make no mistake, those cuts are something a company decides to do, rather than their claims rate, which is something that happens to them. When a truck is sold, the manufacturer predicts how much its warranty will cost, and sets aside that amount at the time of sale as a warranty accrual. When the actual expenses are paid, they are reported as claims. So a company can be wrong -- either predicting low and paying high, or predicting high and paying low. But we won't know how wrong they were until enough time passes, and the actual expenses to be paid in the future can be compared to the predictions of the current time. It's entirely possible that some of these companies are correct in predicting a rapid decline in their warranty expenses in the near future. Navistar has cut its accrual rate from 2.1% a year ago to 1.5% in the quarter ended in January 2016 (its fiscal year ends on October 31). Paccar was even more aggressive, cutting its accrual rate from the 3.4% to 3.7% range it held during most of 2015 to only 1.3% in the first quarter of 2016. Cummins remained about the same and Oshkosh, of course, remained low. Now let's move on to the U.S.-based companies making cars and light trucks. We covered the U.S. output of foreign-based producers such as Honda, Toyota, VW, and Hyundai in previous newsletters. In the June 30 newsletter, we followed the worldwide output of five European OEMs. In the July 7 newsletter, we followed the worldwide warranty costs of four Asian OEMs. This week, we will cover the worldwide output of four U.S.-based auto manufacturers, including General Motors Co., Ford Motor Company, Tesla Motors Inc., and Chrysler. Together these 13 warranty-reporting OEMs represent nearly three-quarters of the worldwide passenger car and light truck industry. Outside of the China-based car manufacturers, they represent four-fifths of worldwide production. Chrysler is a special case among OEMs. Nobody would deny that it is a U.S.-based manufacturer. But at present it is foreign-owned, as it was until Daimler AG sold it to private investors in 2007. For a brief period, it was even U.S. government-owned. But now it's part of Fiat Chrysler Automobiles NV. It's a special case because while Chrysler was part of Daimler, its warranty expenses were not reported separately. While it was owned by private investors and by the U.S. government, it did not report any warranty expenses publicly. And now that it's part of Fiat, it does not report its warranty expenses separately. Therefore, like Nissan, Renault, Suzuki, Mazda, Mitsubishi, and a few other large OEMs, it has a long track record as a non-reporter. However, for a brief period that lasted from the middle of 2009 to the middle of 2015, the U.S.-based subsidiary, called FCA US LLC, sold corporate bonds called secured senior notes that required it to file financial statements with the U.S. Securities and Exchange Commission. And those financial statements included warranty expense data for Chrysler (along with the minimal U.S. sales of Fiat at the time). So we've included those expenses in the charts below, and we've also included the expense records of Tesla, which also began reporting its warranty costs in 2009 but which continues to do so until the present day. Notice that while FCA US starts high and trends lower, Tesla starts low and trends higher. Also notice in Figure 3 that while FCA US had the highest claims rate of these four OEMs at the time it ceased reporting, Tesla now has the lowest claims rate of them all, at 1.5% in early 2016. Yes, that's correct. Despite all the adverse recent publicity about crashes and fires, Tesla currently has a lower claims rate than either GM or Ford. In the first quarter of 2016, GM reported a claims rate of 2.6%, which was actually an improvement from the recall-elevated levels of 2014 and 2015. Ford reported a claims rate of 2.3%, which was actually its highest rate since the middle of 2011. Neither company's claims rate is at a worrisome level, but both are rising. However, the more important metric is the accrual rate, which signals the expectations of the manufacturers themselves. For car manufacturers we can measure it in two ways. In Figure 4 we're looking at the accrual rate as a percentage of manufacturing revenue. In Figure 5 we're looking at the accrual rate per vehicle sold, which we also reported for numerous top European and Asian passenger car and light truck manufacturers in previous weeks. Figure 4 shows a rather large increase in accruals for GM in 2014, which is most likely tied to its rather large safety recalls initiated in that time period. Tesla also shows a few spikes, which we would attribute to nervousness about the newness of electric cars, and uncertainty over the question of whether they were accruing the right amount of funds given the risk of routine claims and unanticipated recalls. Now the company seems to have settled in at an accrual rate of roughly three percent, which, given the relatively high price per vehicle, is still a relatively large amount of money. That unfortunate metric is on display in Figure 5, which takes the number of vehicles sold per year and divides it into the amount of accruals made. In 2014, Tesla set aside $2,930 per vehicle sold. And while that might be a small percentage of a $90,000 vehicle's price tag, it's multiple times what the other U.S.-based competitors were setting aside at the time. In 2015, the average price of Tesla's vehicles continued to drop, its unit sales volume continued to rise, and even though its total accruals rose from $97.2 million in 2014 to $103 million in 2015, its accruals per vehicle sold dropped to $2,036. That's still high, but it's no longer the world's highest. Who's highest? Readers who want to skip ahead for the answer can see it in Figure 7. Again, these are the worldwide figures for U.S.-based OEMs. So we're including Holden in Australia and Opel in Europe, along with Ford in South America and Lincoln in the Middle East. The point is, the terms and conditions of those warranties, and the resulting costs, may vary not only on factors such as reliability and repair costs, but also on the country in which they were issued. Heavy sales in countries with short warranties can result in low warranty costs, just as heavy sales in countries with long warranties can result in high warranty costs. We say that because we don't want anyone to think that these companies have identical product lines, sales channels, and warranty terms, leaving only product quality to explain any differences in warranty expense rates. For multiple years, Ford did not include recall costs in its warranty accounts. And for multiple years, both Ford and GM consolidated the warranty expense of luxury brands such as Jaguar, Land Rover, and Hummer into their overall results. That being said, in Figure 5 we can see a GM that has largely recovered from the recall expenses that drove its accrual rate per vehicle up in 2014. And we see a Ford that continues to accrue under $500 per vehicle year after year. The trend is easier to see in Figure 6, where we've ranked seven top OEMs by the accrual rates per vehicle they paid in U.S. dollar terms in 2015, or in the cases of Toyota and Honda, in the fiscal years ended on March 31, 2016. In both 2014 and 2015, Hyundai has the lowest accrual rate, at $159 and $177, respectively. But in both years the second-lowest was Ford and the third-lowest was GM. In 2014, in fact, GM's accrual rate was quite elevated at $549 per vehicle. But then as recall costs subsided, the accrual rate fell back to $332 in 2015. Ford remained low, reporting a $337 accrual rate in 2014 and a $313 accrual rate in 2015. This is amazing news. GM and Ford have the second- and third-lowest accrual rates per vehicle in the world, or at least they do among all the OEMs that are reporting their warranty costs. And their 2015 per-vehicle warranty costs of $332 and $313, respectively, were both personal bests, at least since public records became available in 2002. Or, to put it another way, in 2015 most of their European competitors accrued between four and seven times as much per vehicle as GM and Ford did. It would not be incorrect to say that Ford and GM's warranties are projected to cost between one-fourth and one-seventh as much as their European counterparts. For those who have all but given up on American manufacturing, well, facts and math don't matter as much as stubborn opinions and unbendable beliefs. Versus the Japanese OEMs, there are plenty extenuating circumstances. Part of the reason Toyota's accrual rates are higher than GM's or Ford's right now is the relative strength of the Japanese yen versus the U.S. dollar. That tends to inflate the dollar-denominated costs, which we're charting here. And part of the reason that Toyota ever accrued more than GM or Ford was the impact of its well-publicized safety recalls. But there's no mistake about the sudden jump in Honda's costs. It's now a high-cost manufacturer. That's the impact of their air bag recalls, which last year more than doubled the company's warranty cost per vehicle, even when counted in yen. But a year from now, they're likely to once again be below the $800 threshold. Nevertheless, we're going to suggest $800 as the line of demarcation between low and high warranty costs per vehicle. And on that basis, Honda has crossed over from low-cost to high-cost in its most recent fiscal year. But we'll leave it in the low-cost group for another year, to see if warranty costs again subside below $800 per vehicle in the future, once the dust settles from the air bag recalls. And while FCA US has stopped reporting, and while FCA's worldwide average is firmly in the low-cost group, we're going to suggest that Chrysler vehicles are and will remain in the high-cost group, even if we don't have new data. So they're one of six OEMs we're tracking in Figure 7, which each have consistently paid more than $800 per vehicle for multiple consecutive years. And we'll leave Fiat in the low-cost group, even if Chrysler eventually drives their worldwide average above $800 (it was $769 in 2015). Actually, for BMW it's been only three consecutive years above $800. In 2012 the company's average warranty cost per vehicle sold was $737. Tata has reported warranty costs above $800 per vehicle for only two consecutive years, though its most recent fiscal year data won't be released for two more weeks. And even FCA US was below $800 in both 2012 and 2013. However, the general trend holds. Neither Volkswagen, Daimler, nor Tesla has ever accrued less than US$800 per vehicle according to our records, although the higher cost of luxury cars makes this less of an issue for these manufacturers as a percentage of revenue. And neither GM, Ford, nor FCA worldwide have ever accrued more than $800 per vehicle, although in some cases the low cost per vehicle and the impact of recalls makes warranty costs more painful as a percentage of revenue than they are per vehicle. BMW, FCA US, and Tata have once or twice dipped below $800, but are generally above that level. Honda, Toyota, and even Hyundai (in 2003) have seen short-lived spikes above $800, but are generally below that level. So we'll keep these OEMs on the side of the line where they usually fall, even if they occasionally cross the line. In conclusion, we can safely say that the German OEMs almost always have higher-than-average warranty costs, partly because of their luxury status, partly because of the exchange rates of the euro, and partly because of recalls. The Japanese OEMs are almost always lower, except when they're hit by a recall crisis. The American OEMs have a mixed track record, with GM and Ford always lower, Tesla always higher, and Chrysler both above and below, while its parent company is always below. Cree offers 10-year warranty on its intelligent lighting systems. Samsung makes Galaxy S7 Active phones more water resistant. Polaris partially blames increased warranty costs for decreased profits. FTC mails extended warranty refund checks to victims of the Dolce Group. B2X executive says smartphone insurance is becoming a necessity. Fitbit must face lawsuit over Flex unit's sleep tracking abilities. Still no definitive fix for defective SEPTA railcars. Kawasaki to repair DC Metro's broken air conditioners under warranty. The Warranty Group selects Saviynt network security application. Australia's National Warranty Services aims for growth. Momentum Toyota dealer in Fairfield CA offers lifetime warranty. Should you buy mobile phone insurance? RepairQ and Warranty Life to offer protection plans for used smartphones. Build-Zone New Home Warranty gets initial CTSI approval in the UK. Two men arrested for swapping fake iPhones for real ones under warranty. Trustmark Warranty adds 48-month/48,000 mile vehicle service contracts. Phoenix American Warranty launches service contract program for Airstream. Michael Bartosch named president of National Home Service Contract Assoc. Global Maritime to provide marine warranty services for Block Island Wind Farm. Choice Home Warranty has highest number of BBB complaints in Houston. Tests find the Galaxy S7 Active smartphone not as watertight as claimed. Consumers left without warranties as text on thermal printed receipts fades. CSR Sifang fixes Singapore's defective train cars under warranty. Standard Pre-Owned dealership owes thousands of dollars to AUL Warranty. SCIC says home warranties provide the best way to stay cool under pressure. Columnist helps hot tub owner recover warranty costs from manufacturer. Philadelphia's defective train cars to be fixed under warranty. Defective Des Moines bridge's warranty covers materials but not labor. Home warranties can be worth it (but read the fine print). HomeServe completes acquisition of Utility Service Partners Inc.
Navistar analytics team uses big data to identify usage patterns. Fatal crash reported in a Tesla Model S running on autopilot. Repair Association says warranty-voiding stickers violate "tying" rule. SCIC video says home warranties are the secret to a happy home. Can dealers hold back the tide on online warranty sales? American Home Shield acquires OneGuard Home Warranties. Newly expanded Panama Canal has a 10-year warranty for defects. Ford dealers upset over the automaker's exit from Indonesia. Security is in the slow lane when it comes to connected cars. Ginsu knife manufacturer still honors 50-year warranty. UK may lose mandated 2-year warranties if it leaves the EU. 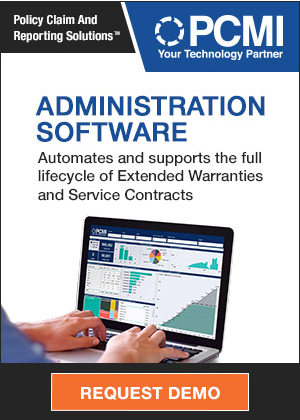 Parts Wizard network helps EFG Companies cut extended warranty costs. Dividend Solar signs definitive merger agreement with Figtree Financing. Herman Miller blames higher warranty expenses for rising operating expenses. MPA launches warranty reduction program for starters and alternators. Toledo seeks 2-year extended warranty on new water plant. Truck fleet owner says warranty management software can pay for itself. Judge rules in Apple's favor, dismisses "error 53" lawsuit. Kitchen Maestro pizza scissors come with a one-year warranty. Service Experts remind HVAC system owners to schedule yearly tune-ups. GWC offers vehicle service contracts starting as high as 150,000 miles. Toyota India to offer 7-year, 140,000 km vehicle service contracts. Google's Nest shuts down Revolve, despite lifetime subscriptions. Michigan auto repair bill (HB 4344) vetoed by governor. ScottishPower warranty scheme labelled a fraud on the public. Ontario auditors concerned about workmanship at Tim Hortons Field. Signet CEO discusses jewelry chain's extended warranty program. Autoguard Warranties CEO explains acquisition of Fleetband Warranty Services. Takata airbag recall expands in China to include over 1 million Honda vehicles. Heavy Truck Warranties: Six companies have 12 brand names that account for almost all the heavy trucks carrying freight on the highways and motorways of North America and Europe. And while it's not possible to figure out how much warranty costs on a per-truck basis, all six parent companies do disclose their total worldwide warranty expenses. Truck, Bus & RV Warranties: Most of the manufacturers are finding ways to reduce warranty costs, but some of the recent increases have been spectacularly huge. Still, the OEMs pay out more than their suppliers do, though the gap is narrower than it is in the passenger car industry. Truck Warranties: Unlike passenger cars, the truck OEM isn't usually responsible for the vehicle's entire warranty. Instead, many of the suppliers and component manufacturers issue their own warranties, and pay their own claims.